California's Clean Vehicle Rebate Project offers up to a $2,500 for electric cars on top of the $7,500 federal tax credit, and the 60 kilowatt-hour Tesla Model S was just listed on the CVRP website. The 60 kilowatt-hour Tesla Model S was quietly added to the California Clean Vehicle Rebate Project's (CVRP) list of approved vehicles. This makes 60 kWh Model S buyers in California eligible for an additional $2,500 of purchase incentives on top of the $7,500 federal tax rebate. The base MSRP of the 60 kWh Model S is $69,900. That gives the buyer a 208 mile electric driving range, a 0-60 time of 5.9 seconds, quarter mile time of 14.2 seconds, top speed of 120 miles/hr, from a 302 hp (225 kW) electric motor in the rear giving 317 lb-ft (430 Nm) of torque. Options include fancy paint job ($750), the all glass panoramic roof ($1500), 21 inch wheels ($3500), leather seats ($1500), an advanced technology package ($3500), sound system ($950), air suspension ($1500), third row of rear-facing seats ($1500), parcel shelf ($250), paint armor ($950), and supercharger support ($2000). The last feature offers the biggest functional improvement, because of the country-wide supercharger network Tesla has begun to build. Parts of the SuperCharger network exists in California, and as of December 2012 in two locations on the East Coast. When built out as envisioned, Tesla Model S or Model X owners will be able to drive coast-to-coast purely on electricity. Because the SuperCharger gives 150 miles of range per half hour of charging, the Model S is the first electric car that can credibly implement a proper road trip, given sufficient SuperCharger stations. The Clean Vehicle Rebate Project (CVRP) is funded by the California Environmental Protection Agency's Air Resources Board (ARB). The program offers a direct rebate to electric vehicle purchasers, rather than a tax credit as offered by the federal government. The size of the rebate depends on the vehicle type, as well as the battery pack size. 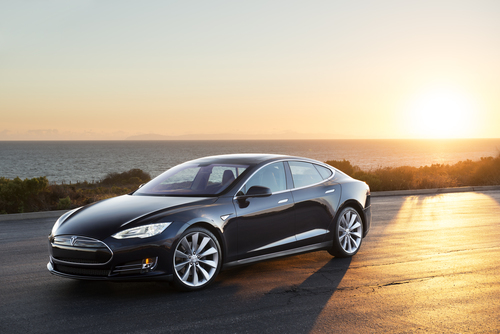 The Model S, like most of the all-electric cars, qualifies for the maximum $2,500 rebate. The hybrid and plug-in hybrid cars generally qualify for a smaller rebate. Electric motorcycles are also covered by the CVRP, and offer a maximum $900 rebate. Between the Federal tax credit and the CVRP it lowers the effective base MSRP to $59,900. To put that into context, what could be bought with that kind of money from other automakers? The Lexus GS sedans start at $47,250, the Lexus GS Hybrid sedans start at $59,450, the Lexus LS sedans start at $71,990, the Lexus LS Hybrid sedans start at $119,910, the Lexus GX SUV's start at $53,795, the Lexus LX SUV's start at $81,530, and the Lexus ISF starts at $61,750. One could go through other luxury automakers (Cadillac, BMW, Mercedes, etc) and find plenty of luxury sedans and cross-overs available for prices similar to the Tesla Model S.
Data revealed by the CVRP in December 2012 showed that, in California, there were Almost 16,000 electric or plug-in hybrids sold in California since March 2010. Of those, 8,168 were electric car's (Nissan Leaf primarily), and 7,327 were plug-in hybrids (Chevy Volt, Toyota Prius Plug-in primarily).